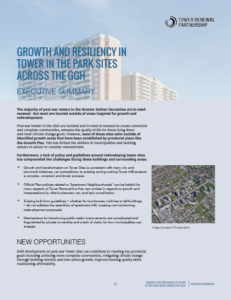 Growth and Resiliency in Tower in the Park Sites Across the GGH describes the challenges of Tower Renewal and energy retrofitting from a policy and built form perspective and introduces a values-based framework to evaluate redevelopment opportunities on Tower Sites, with a focus on using infill development to fund retrofits and side-wide renewal. This research also include findings related to mapping tower sites across the Greater Golden Horseshoe. Download the summary below or read the full report here.